Hand dislocation is a common injury in sports and in occupational settings, often appearing to be minor. If the athlete, trainer, or coach has already reduced the dislocation, it appears unimpressive compared with a major knee injury or a shoulder dislocation. However, hand dislocations have real potential for long-term disability in sports and other areas of life if adequate reduction is not performed, if associated injuries are not identified and appropriately treated or referred, and if potential complications of the injury and its treatment are not foreseen. The judgment of the initial treating physician can be critical in determining the long-term outcome of these injuries. Many hand dislocations can be effectively treated with closed reduction, traction, or both. Grossly unstable joints and those for which closed reduction has failed typically require surgical intervention. Physical and occupational therapy are key components of treatment throughout. Any long-term complications (usually involving stiffness or instability) that develop must be addressed. The bony anatomy of the proximal interphalangeal (PIP) joint consists of medial and lateral condyles on the proximal phalanx, with matching concavities on the associated distal phalanx. The joint has a wide range of motion (ROM) in flexion and extension but is relatively rigid in abduction and adduction; thus, it is a hinge (ginglymus) joint functionally. The bony anatomy of the distal interphalangeal (DIP) joint is similar, but the surrounding soft tissue provides more restriction in flexion. The extrinsic flexors across both joints are at least 4 times stronger than the extensors, allowing flexion contractures to develop very rapidly, especially with immobilization in flexion. Adequate ROM, especially at the PIP joint, is critical for normal hand function. The PIP and DIP joints are both supported on all 4 sides by similar soft-tissue structures, which include the volar plate on the palmar side (the integrity of which is essential for a stable reduction), collateral ligaments on the radial and ulnar sides, and the extensor complex (central slip, lateral bands, and hood) dorsally (see the image below). These structures attach to and reinforce the joint capsule. For a dislocation to occur, at least 1, often 2, and sometimes 3 of these structures must be significantly injured. Lateral view of relevant finger anatomy. The volar plate is a roughly triangular structure with its base oriented distally, attaching to the volar base of the middle phalanx with its tip attaching to the distal aspect of the proximal phalanx. The volar plate functions largely in limiting hyperextension. Thus, it is nearly always injured in dorsal dislocations. The collateral ligaments restrict the joint from opening to varus or valgus stress and are also commonly injured in dorsal dislocation. Injury to the radial collateral ligament is about 6 times more common than injury to the ulnar collateral ligament. 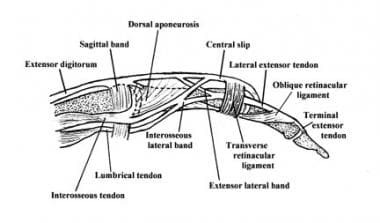 The extensor complex comprises the central slip, which attaches to the base of the middle phalanx; the lateral bands, which run dorsolaterally on each side; and the transverse retinacular ligament, which connects these structures and extends laterally. It helps limit volar movement of the base of the middle phalanx and thus is commonly injured in volar dislocations at the PIP joint, with the middle phalanx either tearing the central slip from its insertion or buttonholing through the transverse retinacular ligament between the central slip and a lateral band. To accomplish flexion and extension at the MCP joint, the anterior and posterior parts of the capsule must be lax. When the joint is extended, the phalanges have considerable lateral play in abduction and adduction; consequently, this joint is not frequently injured. However, if the ligament is torn, dislocation occurs. The MCP joint of the thumb has radial and ulnar collateral ligaments, which are loose when the joint is extended and tight when flexed. When the joint is extended, the proximal phalanx has the lateral play achieved by the action of the interosseous muscles. When the thumb is flexed and in a functional position, as in the case of many sports situations (eg, skiing, falls on a gloved hand), the ulnar collateral ligament is the structure at risk and can be ruptured (see Skier’s Thumb). The ulnar collateral ligament can then be displaced so that the adductor aponeurosis is interposed between the ruptured end of the ligament and its site of bony attachment. The bony anatomy of the carpometacarpal (CMC) joint consists of the 5 metacarpal bases that articulate with the trapezoid, trapezium, capitate, and hamate (in that order) from the radial aspect of the hand to its ulnar aspect. The CMC joint is a relatively fixed joint segment because of the articular congruity of the joint surfaces, with the metacarpal bases acting like concave receptacles to the distal carpal row, and because of the strong interosseous and extrinsic ligament complex. The palmar and dorsal ligaments are distinct, with the palmar ligaments being stronger. The scaphoid acts as a link between the proximal and distal carpal rows. The extensor and flexor tendons pass over this articular area but add no strength to the CMC joint because the bases of the metacarpals dislocate dorsally relative to the distal carpal row. The first CMC joint (also referred to as the first metacarpotrapezoid joint) is a highly mobile saddle joint, with articular surfaces that are reciprocally concavoconvex. The most important soft-tissue support for this first CMC joint is the deep ulnar or anterior oblique ligament, which runs from the volar beak of the metacarpal to the tubercle of the trapezium. This ligament can be ruptured, but it tends to be avulsed with a piece of bone (Bennett fracture-dislocation). Traumatic force applied to the hand can be transmitted to bone, soft tissue, nerves, and vascular structures. Because the structures of the hand are close to the surface and near each other, injury often results in a combination of fractures, dislocations, and soft tissue injury. The DIP and PIP joints both have lateral ligaments and a fibrous volar plate. Common dislocations are posterior or lateral. Typical forces resulting in DIP dislocations include a jamming blow to the end of the finger. Forces that commonly lead to PIP joint dislocation include axial loading or hyperextension. Lateral dislocations can result from radial- or ulnar-directed force on the joint. Dislocations of finger MCP joints are rare and frequently are trapped by the surrounding ligaments, in which case surgical relocation is necessary. MCP or palmar dislocations occur when a hyperextension movement occurs with rotation. The finger is bent back toward the top of the hand and is twisted during the injury. The finger may have been pushed, or compressed, during the injury. MCP dislocations are typically associated with fractures. CMC joint dislocation  is not always a high-energy injury. Identification involves careful analysis of subtle findings on radiographs and may require additional radiographic views. Missed diagnosis of carpometacarpal dislocation can result in significant morbidity. Dislocations of the PIP and DIP joints of the hand probably occur most commonly in basketball and football. In basketball, the usual mechanisms include being struck by the ball, catching a finger on the rim, or contact with another player. In football, the finger may be caught on a jersey, slapped against a helmet, or crushed between some combination of players, equipment, and the ground. Linemen and defensive players are at highest risk. In both sports, return to play almost always requires that the injury can be splinted stably to allow a power grip. Dislocations of the MCP and basilar CMC joints occur most commonly with falls on the outstretched hand (so-called FOOSH injury) or the flexed supinated wrist. With this extension vector, the forces are transmitted up through the carpus. Injuries and dislocations of the thumb, the MCP joint, and the CMC basilar joint commonly occur in falls with the thumb in abduction. Examples of this type of injury include a fall on the gloved hand in baseball or application of an abduction force to a flexed thumb while the hand is grasping an object—as in skiing injuries, when the pole impacts the proximal phalanx tearing the radial collateral ligament. This occurs when the wrist is extended at the time of the injury. Most of these injuries are dislocations at the PIP joint, because the greater ROM of this joint makes it more vulnerable to injury. Of the PIP dislocations, most are dorsal. Volar dislocations of the PIP joint are much less common, more difficult to reduce, and associated with more complications. DIP joint dislocations are also uncommon, almost always dorsal, and often open. In addition to PIP and DIP joint dislocations, MCP and CMC joint dislocations also occur, though less frequently. [4, 9, 10] The MCP joint of the 4 fingers usually dislocates posteriorly (simple type) but can, on rare occasions, become entrapped between the palmar fascia and the palmar plate and become irreducibly dislocated. CMC joint dislocation is a disabling injury, which is usually dorsal and may be associated with fractures of the bases of the metacarpals. Transcarpal fractures in children are rare, but the emergency physician must be cognizant that they do occur. Anatomic restoration of dislocated joints is imperative for achieving good long-term outcomes. Accurate and stable reduction, early fixation, and initiation of ROM exercise are very important. Dislocations can lead to osteoarthritis, compression neuropathies, and carpal tunnel syndrome. Additional disability from chondrolysis, carpal instability, and traumatic arthritis can also occur. Median or ulnar neuropathy can occur from direct nerve compression or increased pressure within the median or ulnar nerve canals. Evaluation of the patient’s nerve status is especially important in the early evaluation of carpal dislocations. Grip strength must be tested before and after reduction. The prognosis is good for simple PIP dislocations and most DIP dislocations, as well as for volar dislocations with the central slip intact (rotatory subluxations). Frequently, some loss of ROM occurs, but with adequate rehabilitation, a functional range can be maintained. The prognosis is fair for volar dislocations with avulsion of the central slip if the diagnosis is made at the time of initial evaluation and proper treatment initiated; however, the prognosis is fair to poor for dorsal fracture-dislocations. The prognosis is poor for any dislocation that is incompletely reduced for more than a few days and is very poor for a dorsal fracture-dislocation or a volar dislocation with central slip injury if the diagnosis is not made and appropriate treatment instituted early in the course of the injury. The prognosis is good in most MCP joint and CMC joint dislocations that are treated early. Delay in diagnosis and treatment may progressively worsen the prognosis. Long-term sequelae of hand dislocations with injury to the joint surface include instability, ankylosis, and arthrosis. All athletes in high-risk sports should know to have significant finger injuries evaluated and treated by the team physician or trainer at the time they occur. This helps to avoid some of the morbidity from fracture-dislocations, boutonniere injuries, and incompletely reduced dislocations. In addition, all athletes who sustain these injuries should be made aware of the importance of timely follow-up, of the expected duration of immobilization, and of the rehabilitation plan, goals, and timetable. For patient education resources, see Broken Hand, Broken Finger, and Hand Injuries. Bhargava A, Jennings AG. Simultaneous metacarpophalangeal joint ulnar collateral ligament injury and carpometacarpal dislocation of the thumb in a football player: a case report. Hand Surg. 2009. 14(1):23-4. [Medline]. Lefere M, Dallaudière B, Omoumi P, Cyteval C, Larbi A. Rare carpometacarpal dislocations. Orthop Traumatol Surg Res. 2016 Oct. 102 (6):813-6. [Medline]. [Full Text]. Isani A, Melone CP Jr. Ligamentous injuries of the hand in athletes. Clin Sports Med. 1986 Oct. 5(4):757-72. [Medline]. Kahler DM, McCue FC 3rd. Metacarpophalangeal and proximal interphalangeal joint injuries of the hand, including the thumb. Clin Sports Med. 1992 Jan. 11(1):57-76. [Medline]. Lairmore JR, Engber WD. Serious, often subtle, finger injuries. Avoiding diagnosis and treatment pitfalls. Phys Sportsmed. 1998. 26(6):57-69. Mall NA, Carlisle JC, Matava MJ, Powell JW, Goldfarb CA. Upper extremity injuries in the National Football League: part I: hand and digital injuries. Am J Sports Med. 2008 Oct. 36(10):1938-44. [Medline]. Lubahn JD. Dorsal fracture dislocations of the proximal interphalangeal joint. Hand Clin. 1988 Feb. 4(1):15-24. [Medline]. Hubbard LF. Metacarpophalangeal dislocations. Hand Clin. 1988 Feb. 4(1):39-44. [Medline]. Gurland M. Carpometacarpal joint injuries of the fingers. Hand Clin. 1992 Nov. 8(4):733-44. [Medline]. Inoue G, Maeda N. Irreducible palmar dislocation of the proximal interphalangeal joint of the finger. J Hand Surg [Am]. 1990 Mar. 15(2):301-4. [Medline]. Al-Qattan MM. The triad of multiple metacarpal fractures and/or dislocations of the fingers, severe hand swelling and clinical evidence of acute median nerve dysfunction. J Hand Surg Eur Vol. 2008 Jun. 33(3):298-304. [Medline]. Kaufman Y, Cole P, Hollier L. Peripheral nerve injuries of the pediatric hand: issues in diagnosis and management. J Craniofac Surg. 2009 Jul. 20(4):1011-5. [Medline]. Sharma BR, Myint S, Reddy IS, Sammut D. Rotatory subluxation of proximal interphalangeal joint of the finger. Eur J Emerg Med. 2010 Feb. 17(1):20-1. [Medline]. Calfee RP, Sommerkamp TG. Fracture-dislocation about the finger joints. J Hand Surg Am. 2009 Jul-Aug. 34(6):1140-7. [Medline]. Broadbent MR, Bach OS, Johnstone AJ. In situ rotational dislocation of the trapezoid associated with carpal-metacarpal dislocations. Hand Surg. 2009. 14(1):31-3. [Medline]. de Haseth KB, Neuhaus V, Mudgal CS. Dorsal fracture-dislocations of the proximal interphalangeal joint: evaluation of closed reduction and percutaneous Kirschner wire pinning. Hand (N Y). 2015 Mar. 10 (1):88-93. [Medline]. Kovacic J, Bergfeld J. Return to play issues in upper extremity injuries. Clin J Sport Med. 2005 Nov. 15(6):448-52. [Medline]. Freiberg A, Pollard BA, Macdonald MR, Duncan MJ. Management of proximal interphalangeal joint injuries. J Trauma. 1999 Mar. 46(3):523-8. [Medline]. McDevitt ER. Treatment of PIP joint dislocations. Phys Sportsmed. 1998. 26(8):85-6. Melone CP Jr. Joint injuries of the fingers and thumb. Emerg Med Clin North Am. 1985 May. 3(2):319-31. [Medline]. Thayer DT. Distal interphalangeal joint injuries. Hand Clin. 1988 Feb. 4(1):1-4. [Medline]. Vicar AJ. Proximal interphalangeal joint dislocations without fractures. Hand Clin. 1988 Feb. 4(1):5-13. [Medline]. Waris E, Mattila S, Sillat T, Karjalainen T. Extension Block Pinning for Unstable Proximal Interphalangeal Joint Dorsal Fracture Dislocations. J Hand Surg Am. 2016 Feb. 41 (2):196-202. [Medline]. Waris E, Mattila S, Sillat T, Karjalainen T. Extension Block Pinning for Unstable Proximal Interphalangeal Joint Dorsal Fracture Dislocations. J Hand Surg Am. 2016 Feb. 41 (2):196-202. [Medline]. [Full Text]. Kiefhaber TR, Stern PJ, Grood ES. Lateral stability of the proximal interphalangeal joint. J Hand Surg [Am]. 1986 Sep. 11(5):661-9. [Medline]. Wilson RL, Liechty BW. Complications following small joint injuries. Hand Clin. 1986 May. 2(2):329-45. [Medline]. Volar proximal interphalangeal (PIP) joint dislocation. Hand dislocation. Dorsal aluminum foam splint. Complex second metacarpophalangeal dislocation in a skeletally immature patient (same patient as in the next 2 images). Note the position of the finger and dimpling of skin on volar hand. Radiograph of the hand of a patient with complex second metacarpophalangeal dislocation (same patient as in the previous and next images). Intraoperative photo of the second metacarpophalangeal joint (same patient as in the previous 2 images). Note the displaced volar plate between the metacarpal head and the proximal phalanx. Normal lateral band location, dorsal to the axis of rotation of the proximal interphalangeal joint. After central slip disruption, lateral bands migrate volar to the axis of rotation of the proximal interphalangeal joint. Anteroposterior radiograph displaying a gamekeeper's fracture. Lateral radiograph displaying a gamekeeper's fracture. Completed UCL repair using suture anchors for fixation (same patient as in the image above). Radiograph displaying a stress test of a torn ulnar collateral ligament. Fourth and fifth metacarpals after intramedullary pinning, lateral view.